The first $20 million of forestry peace deal money is no longer linked to the forest reserve legislation. The Greens are fuming about the Federal Government's latest change to the forest peace deal. The first $20 million in regional development funding under the deal is no longer conditional on the success of legislation to create new forest reserves. Greens Senator Christine Milne says it is a massive breach of faith. 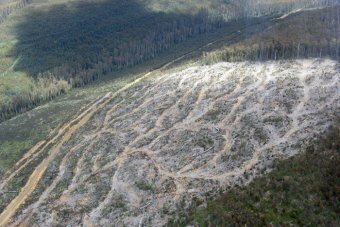 "The loggers get their money, the regional development money flows and the conservation agenda is shafted." "The people who are being taken for a ride here are the people who negotiated in good faith and believed that for Commonwealth money to be spent there would be conservation outcomes," she said. She says it is an insult to conservation and industry groups which negotiated the $276 million peace deal. "What does this mean for the agreement if it can be amended at whim without consultation, without anyone knowing what it means?" "I think we've got a situation now where we've got an intergovernmental agreement that is meaningless." But the Federal Minister Simon Crean says he made the change to put the faltering peace deal back on track. "Really, this puts the onus back on those who have still got reservations to say 'do we want more of this or more of the unrest'?" All but three of Tasmania's 15 MLCs say they will block the legislation unless green groups end their overseas campaigns against Ta Ann Tasmania. Of the total funding package, $100 million is still linked to the legislation. Mr Crean will meet MLCs this morning to win support for the forest peace deal. Huon MLC Paul Harriss says the change to the peace deal will not change the minds of his colleagues. "People will see through that, for goodness sake, you know, what does he take us for?" "The whole $120 million in regional development money is nothing but a sop anyway and in essence it's blood money." "We're talking close to a $1 billion industry in this state and to think that they can replace it with just $120 millions in regional development money is just a joke," Mr Harris said.